Every person can help improve and enhance the lives of those living with cancer. Whether you (or your business) host a fundraiser, join a leadership board, or welcome those we serve when they walk through our doors, every little thing you do can make the difficult path of cancer just a little easier for participants. Join the caring network of people at the Cancer Wellness Center that help our staff improve and enhance the lives of those living with cancer. As we continue to develop the work of the Center, our need for volunteers grows too. There are a variety of ways to help and we encourage people across our community to join us. Help raise money to provide meaningful programs and services to our participants. You can either volunteer to help with one of the fundraising events the Center holds throughout the year or create your own. We welcome new ideas and fresh perspectives to help further our mission to improve the lives of people living with cancer. 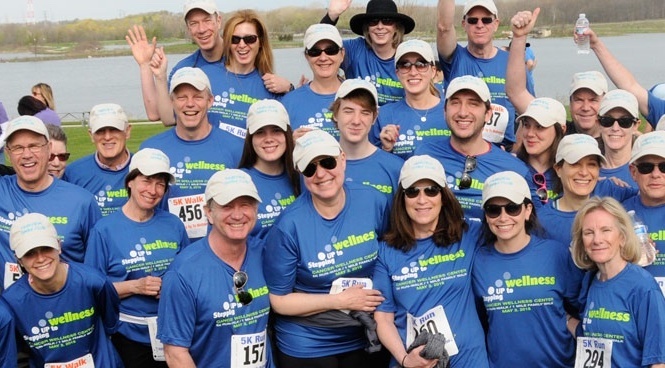 Join the next generation of leaders at the Cancer Wellness Center. Event committee chairs are individuals committed to our mission that build a network of support for the event and the Center. They share their personal stories and reach out to friends, neighbors, colleagues, and family to help secure gifts needed to sustain Center programs and services. Social media makes it easy and fun for you to help further the Cancer Wellness Center mission. Start sharing to help improve the lives of those living with cancer. Corporations and small businesses can generously support the Cancer Wellness Center through employee volunteer programs, employee matching gifts and annual giving campaigns.